This week sucked. I would like to blame all of my problems on Quicken. I. WHAT‘s WORKING?Let‘s start on a positive note. Doing my goals is working. I am accomplishing them, mainly due to the fact that they are hovering over me like a school marm tapping her watch. It prevents them from eking out into the abyss of 100%. Dennis Hightower, former big-time Disney exec, advised “Good general managers must be able to make decisions with between 40 and 70% information.” So, there you go. Lodged firmly in between 40% and 70%, I listed Hot Mommas Project internships online at GWU (George Washington University), talked with a tech guru, forged ahead with my research, all the while taking care of my mom and being totally ill myself (now, having intense love affair with the z-pack). Every blog needs a creepy doll picture. 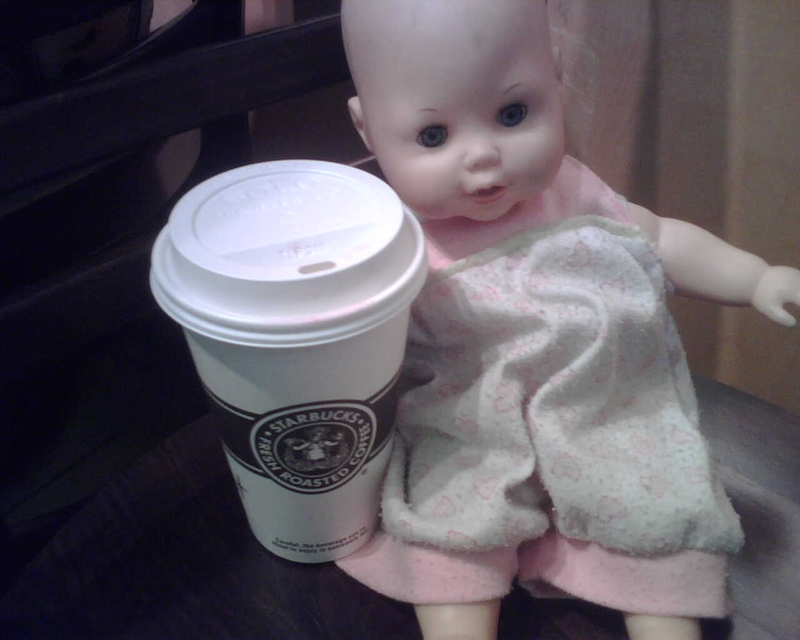 Here is my loyal non-mammalian business partner (yes, a Starbucks coffee) on a playdate with my daughter‘s doll. Okay, fun‘s over, back to work. 1. SOMETHING – It‘s always something. If it‘s not me being sick, it‘s my kids…if it‘s not my kids, it‘s a friend…etc. etc. So, there were a lot of “somethings” this week. Something doesn‘t seem to be going away. 2. FAMILY WITHDRAWL – Because of the “somethings” I barely saw my kids and husband this week. Need to do a bit more schedule triage (below). (See first post on schedule triage). 3. BURN OUT – After many “somethings” and subsequent worrying about “somethings,” I was left with I the brain capacity of an amoeba, except crankier. III. THE PLAN – WHAT DID I ACCOMPLISH? · Accomplished this. On track. 04/10/08 – Develop intern/staff listings and post. 04/10/08 – Research – Draft report 75% complete. · Accomplished this. On track. (This is a crock, however, as the remaining 25% of questions are a complete nightmare to analyze). 04/17/08 – Conversation with software developer to sketch out scope and costs. · Confidence level: High. Need to develop priorities list and get to tech partner on 4/15. · Confidence level: medium. Not sure how long it takes tech partner to develop budget. Will let him know about my deadline. 04/17/08 – Develop sponsorship kit final + target list. · Confidence level – high. Can have draft and initial target list, even if budget is not ready. 04/17/08 – Research – Draft report 100% complete. Submit to GW advisors for comment. · Confidence level – low. Have many open ended answers to code and not sure how this is going to happen. IV. SCHEDULE TRIAGE RIDES AGAIN! 6.0 – Personal (sick/squeezing in time with kids /hubby due to “somethings”). Conclusion: An additional 6-8 additional hours will free up this and next week, and maybe another 6 to 8 the week after that. No G*d Knows What time suckers (see original triage post). Good. 1. Be outside of the house 1 night only (last week was 4 nights 3 with mom at hospital, one at my forum*). 2. Work out 4x during the week, one time at home or on walk with kids/hubby. 3. Plan 3 fun/nice things (each) for kids and for hubby. 4. Multi-task and work at my mom‘s house now that she is out of hospital. 5. Plan time with my best friend Julie. *Definition of Forum = group of mentors. Meets 1x per month. Amazing. Changed my life. Click here for book on forum (“Forum: The Secret Advantage of Successful Leaders”) by one of the world‘s leading forum facilitators, Mo Fathelbab. 1. Introduction to time management. 5. Prioritized to do lists. · CLOSING ALL NON-RELEVANT DOCUMENTS ON MY COMPUTER. Things are getting done. This is good. Goals are good. Still have not completed action plan for writing “How to Be a Hot Momma” book. Need to balance a teensy big more prior to getting another plate spinning. Don‘t want to degenerate back into a cranky amoeba. What is the #1 trait Hot Mommas (in our survey) are saying has helped them professionally? Perseverance. So, I am marching on. Thanks – again – to all of you who have posted offering comments and encouragement. Feel free to post your own goals here, too. Thanks for the informative post. http://www.confidencebuildingcourses.com has plenty of tips that helps to build on your confidence.Building confidence has never been this easy. You should check it out. Confidence is a big deal in womens’ leadership, and in being an entrepreneur. Good topic. I found the best thing to my sister’s birthday… It’s really hard to find cool and still unique. What are the best VPS web hosting company? My name is Jason I’m 27 years old, I’m Belgian. Man .. Excellent .. Wonderful .. I’ll bookmark your site and take the feeds additionallyI am glad to search out a lot of useful info here within the put up, we want work out more techniques on this regard, thank you for sharing. . . . . .